Government and Taxes: BWorld 113, Peace talks with CPP-NDF for another 30 years? 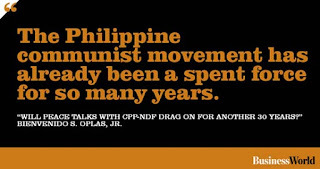 BWorld 113, Peace talks with CPP-NDF for another 30 years? * This is my article in BusinessWorld last February 17. 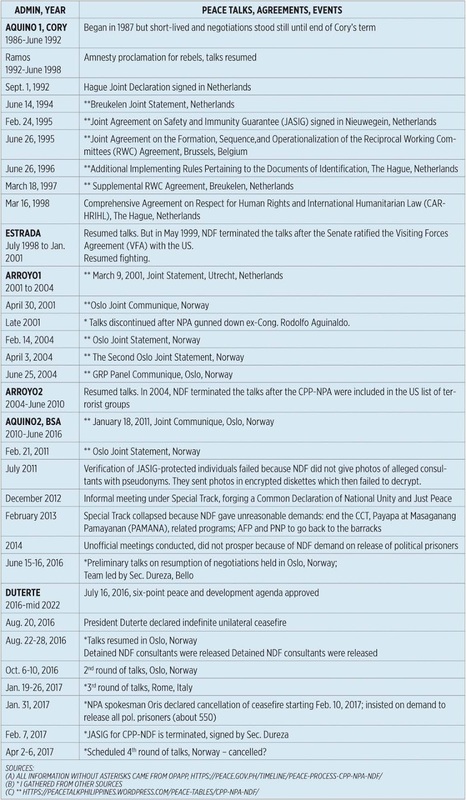 After three decades (1987-2017) of peace talks between the Philippine government and the Communist Party of the Philippines-National Democratic Front (CPP-NDF), all held in Europe (Netherlands, Norway, Belgium, Italy, etc. ), what lessons have we learned? There are at least two. One is that the “endless peace talks” for the past 30 years might continue for another 30 years or more. 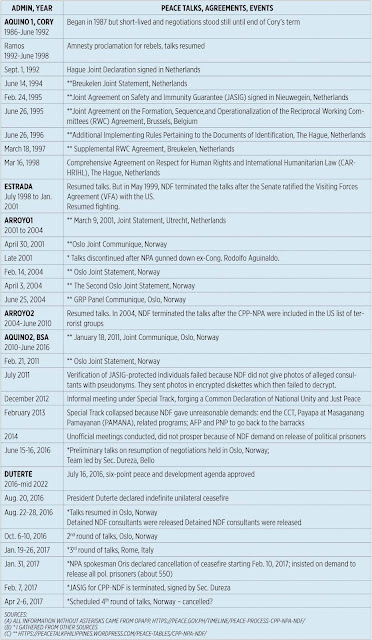 Here is a brief time line of those peace talks that I gathered from various sources. Joma Sison and his team in Europe have earned huge media and political mileage. They can continue getting funds for these high-profile peace talks so they will want the talks to continue for the next 30 years or more, with their kin and buddies as future negotiators. Similarly, media and political mileage have also benefitted negotiating teams of the Philippine government, regardless of administrations. At least they get frequent, all-expenses paid trips to Europe. So there is also incentive for them and future government negotiators to continue the talks for the next 30 years or more. Second lesson, since the CPP-NDF negotiators have been residing in Europe for decades, could it be that the Philippine government is negotiating with foreigners but previously Filipino citizens? My source says several negotiators have become either Dutch or Spanish citizens. I am not a big fan of nationalism so this issue is not that important to me. I am just curious if some groups will insist on the citizenship issue, will there be no legal problems? The Philippine communist movement has already been a spent force for so many years. The Philippine government should treat them just like other organized criminal groups engaged in extortion and armed attacks. Likewise, the Europe-based CPP-NDF negotiators are spent leaders who are better ignored than heard, for the next decade/s to come. They will continue making unreasonable demands to cover up their irrelevance.